Pattern:Round Sharp. Hole Dia.:3mm. Size:10 6mm. Los envíos serán CERTIFICADOS. si se pierde y no te lega recuperas tu dinero no tienes ninguna problema. En ese caso SI que nos haríamos cargo de la devolución.Reclamaciones Problemáticas :Envíos con problemas ne deseadas y con sufrimientos por los dos partes y perdidas de dineros y tiempo. Fleur Floral fantaisie Pandora Style bouchon perle. L'outil libre de liste. Type Charm(s). TIPO : Stopper (Bracciale). Argento 925. MATERIALE : Argento 925. SOGGETTO : Charm Tondo Argento Lucido. COLORE : Argento. Il prodotto dovrà essere restituito integro e completo di tutte le sue parti ed accessori, comprese eventuali garanzie, istruzioni, licenze d'uso, cavi, etc. TIPO : Stopper (Bracciale). Argento 925. MATERIALE : Argento 925. Inoltre da Città Oro puoi personalizzare i tuoi oggetti. 97 80045 Pompei (NA) P.IVA 06950111218. COLORE : Oro. Il prodotto dovrà essere restituito integro e completo di tutte le sue parti ed accessori, comprese eventuali garanzie, istruzioni, licenze d'uso, cavi, etc. Note that the stopper does not work on leather bracelets. Weight: 0.35 g. Designer: Lise Aagaard.and make a pause in life. or in the beads rolling back and forth on your bracelet. Women Clip Lock Beads Water Ripple Stopper Bead Fit Bracelets & Bangles DIY. Le 19-mars-19 à 18:37:05 Paris, le vendeur a ajouté les informations suivantes . Collezione : Stopper Bullone. Codice Prodotto : SR 008. Materiale : Argento 925. Fabbricazione : Made in Italy. Tipo di pietre : Assenti. Collezione : Stopper Cuori. Codice Prodotto : SR 006. Materiale : Argento 925. 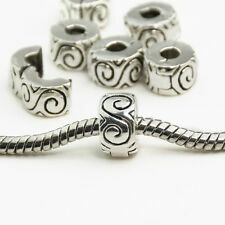 Compatibile con bracciali Pandora, Trollbeads, Brosway, etc. Fabbricazione : Made in Italy. Collezione : Stopper Fiore. Codice Prodotto : SR 007. Materiale : Argento 925. Fabbricazione : Made in Italy. 790870CZK numéro de perle. Authentique Pandora en argent Sterling extra-large Voir la bouchon perle. Cette perle a été supprimée et il est difficile de trouver. Tout neuf! Argent sterling massif avec des pierres cz noir. Note that the Copper Stopper does not work on leather bracelets. Designer: Lise Aagaard. Tedora Bead Stopper Liscio in Argento 925. Collezione : Stopper Liscio. Materiale : Argento 925. Codice Prodotto : SR 001. Fabbricazione : Made in Italy. 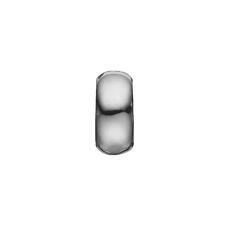 Compatibile con bracciali Pandora, Trollbeads, Brosway, etc. Authentique Pandora en argent Sterling Show Stopper perle. 790545CZ numéro de perle. Tout neuf! Argent Sterling massif avec cz clair pierres. Country of Manufacture Thailand. Modified Item No. Codice Prodotto : SR 013. Materiale : Argento 925. Collezione : Cuore. Collezione : Luna. Codice Prodotto : SR 017. Materiale : Argento 925. Codice Prodotto : SR 018. Materiale : Argento 925. Codice Prodotto : SR 014. Collezione : Angelo. Materiale : Argento 925. Métal Argent sterling. Couleur dominante Noir. Style Traditionnel. Put a point and go head to head. Designer: Søren Nielsen. Main Material: Silver. 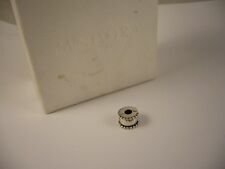 Weight: 1.34 g.
Le 12-avr. -19 à 12:13:22 Paris, le vendeur a ajouté les informations suivantes . 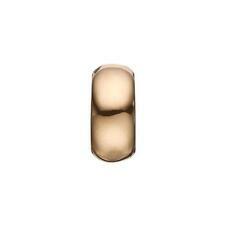 Trollbeads Copper Stopper- TCUBE-00001. Note that the Copper Stopper does not work on leather bracelets. We have reached our goal buyng directly from the firms without any go-betweens. Designer: Lise Aagaard. Note that the stopper does not work on leather bracelets. We have reached our goal buyng directly from the firms without any go-betweens. Weight: 0.35 g. Designer: Lise Aagaard.and make a pause in life. or in the beads rolling back and forth on your bracelet. Point and Head stopper. Put a point and go head to head. We have reached our goal buyng directly from the firms without any go-betweens. Designer: Søren Nielsen. Main Material: Silver. Weight: 1.34 g.